The heart of the ParaLite is an onboard microcontroller that monitors a 3 axis accelerometer and provides the strobing current that powers the brilliant 1 watt LED light. 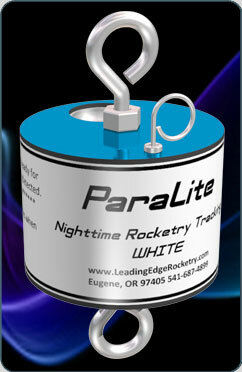 Installing the ParaLite into an existing rocket is extremely simple! Step 1. Remove your parachute from the recovery system. you just removed the parachute. Step 3. Connect the end of your parachute shroud lines to the top eyelet of the Para.Lite. Installing the ParaLite with a new rocket build is a snap! Step 1. Connect the rear eyelet of the Para.Lite to your recovery system at the location recommended by the rocket kit manufacturer. Step 2. Connect the end of your parachute shroud lines to the top eyelet of the ParaLite. Note: Using Quick-Links to connect ParaLite to your recovery is the preferred method and allows you to quickly and easily switch your Para.Lite between different rockets. With all of your recovery components connected, pack the recovery into the rocket as you normally would before flight. Now, manually deploy the system by pulling the recovery out allowing all the components to pull free of the rocket. This is best done on the floor and with an assistant. Check to see that the recovery pulls free and in the expected arrangement. lt is always a good idea to ground test a new recovery system to ensure proper deployment. That's it! You are ready to fly. Pack your recovery system as usual, taking care not to pack the recovery system too tight. Once you are at the pad, but before arming or installing any igniters or pyrotechnics, pull the switch pin on the ParaLite. Para.Lite will flash for 3 seconds and then hibernate. Replace any removed recovery components and nose cone and proceed as you normally would. ParaLite is armed and waiting until the accelerometer detects launch. Once launch is detected ParaLite will activate, ready for deployment.